Sophia Woo is a percussionist with the Hong Kong Philharmonic Orchestra as well as a percussion instructor at the Hong Kong Academy for the Performing Arts, Hong Kong Baptist University and the Chinese University of Hong Kong . Sophia Woo started her music studies at the HKAPA, majoring in percussion with Mr. Lung Heung-wing. After graduating with distinction in 1990, she was awarded The Bernard Van Zuiden Music Fund Scholarship for advanced studies at London - Guildhall School of Music and Drama with David Corkhill (Principal Percussion, Philharmonia Orchestra), Michael Skinner (Principal Percussion, Royal Opera House) and Terry Emery (Percussion, BBC Symphony Orchestra). In England , she was selected as a member of the Guildhall New Music Ensemble, giving various performances and touring overseas to her hometown of Hong Kong in May 1991. In the summer of the same year, she performed Xenakis' "Rebounds" for the "Young Musician of the Year-- Percussion Master Class, 1991" for a BBC-TV broadcast. 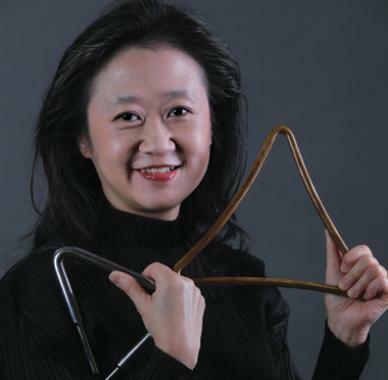 Before starting with the Hong Kong Philharmonic Orchestra in 1992, she had been freelancing with the orchestra for five years and served as Principal Percussion with the Hong Kong Sinfonietta and the Macau Chamber Orchestra. Sophia Woo is involved with many chamber music and solo works. She performed at the ISCM-ACL World Music Days Festival, and represented the HKPO at the Asian Friendly Concert in Fukuoka , Japan in 1994. In December of the same year, she performed the Berlioz Requiem with the Boston Symphony Orchestra, with Seiji Ozawa conducting. One of the founders of Jenga -- The Hong Kong Percussion Quartet, set up in 1998, she has also performed with the Hong Kong Percussion Group. In 1999, the HKPG gave a series of concerts at the Culture of Europe Festival, in Weimar , Germany . In addition to her busy performance and teaching schedule, Sophia has also given lessons in Macau before 2004 as a volunteer and workshops at the Macau Youth Music Festival in 2001 and 2002, a programme of the Cultural Institute of the Macau S.A.R. Government. Sophia is very enthusiastic about the music education in Hong Kong . She has been invited to give masterclasses and workshops presented by the Hong Kong Philharmonic Orchestra since 2004 and was invited to be a juror of the Hong Kong Young Musician of the Year 2008 and 2010. Apart from performing in the concert hall, Sophia gives a a lot of ensemble visits to the primary schools, secondary schools, special needs schools and universities in Hong Kong under the Young Audience Scheme by the HKPO. As a volunteer, Sophia also hosted a drum circle class as a music therapy for the Beacon Hill School in 2011 and 2012.